HURFOM: Today on World Refugee Day, HURFOM honors all refugees, asylum-seekers, and internally displaced people around the world. HURFOM calls on governments, ethnic armed groups, civil society organisations, donors, and the international community to end the human rights violations which are causing people to flee their homes, and to aid all refugees, asylum-seekers and displaced people. According to the Global Peace Index there are currently 68 million refugees and internally displaced people in the world, the most since records began following WWII. 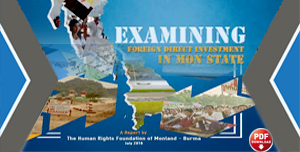 In Burma, refugee and IDP crises are escalating across the country. There are gross violations of human rights happening right now in Rakhine, Kachin, and Shan states in particular. Over 700,000 ethnic Rohingya have been driven from their home in Rakhine State since August 2017. The UN described the attacks as ‘a textbook example of ethnic cleansing’. Human Rights Watch documented widespread gang rapes carried out by members of the Burmese military against Rohingya women and girls, as well as killings, arbitrary arrests, and mass arson in hundreds of Rohingya villages carried out by Burmese security forces. 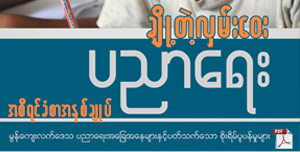 The Burmese military has denied all accusations. Some 40,000 Rohingya women and girls living in refugee camps in Bangladesh are pregnant and due to give birth in the coming weeks. As the monsoon rains hit, hundreds of thousands of Rohingya refugees currently living in refugee camps are in danger from flooding; several fatalities have already been reported. In Kachin State, the conflict between the Burmese military and the Kachin Independence Army has escalated since January. A number of civilians have been reported killed, and thousands have fled their homes since the start of the year, according to the OHCHA. The UN estimates that there are now around 103,000 displaced people in camps and settlements in Kachin and northern Shan states as a result of the conflict. 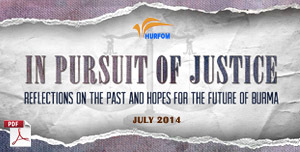 HURFOM stands in solidarity with all displaced people in Burma and surrounding countries. While these gross human rights violations are causing hundreds of thousands to flee their homes around Burma, and must be addressed as a priority, it is important also to remember the ongoing plight of people who have been displaced for years. 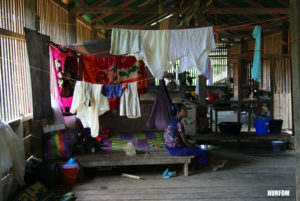 IDP camps in Mon State – where some people have lived for decades, and to which ever more recently-displaced people continue to move – have been neglected, and their funding has been cut in recent years. Until the government addresses the root causes of displacement, people will continue to be forced to flee their homes, and the safe, voluntary return of displaced people will be not be possible. Land confiscation is a major reason many people leave their homes. 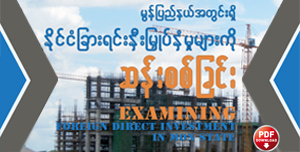 Land confiscations have increased since government reforms started in 2011, as the government has encouraged inward investment and megaprojects. Encouragement of megaprojects and inward investment has encouraged human rights violations, as well as increasing food insecurity and forced migration. Many people flee their homes because of having to do forced labour for the Burma army. One woman told us how the Burmese military forced even mothers with new-born babies to cut rocks for the railway, and how people were sexually abused and beaten, sometimes to death. Others told us how they fled because of army torture. Displaced people we interviewed are clear about what they want for the future. 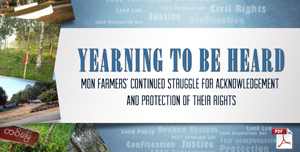 Housing, property and land rights must be acknowledged and restored. The root causes of displacement, including the impunity for human rights violators and the lack of rule of law, must be addressed before there can be safe and voluntary return for displaced people. As a priority, HURFOM calls on governments, aid agencies, and the international community to restore aid to the IDP camps and resettlement sites. 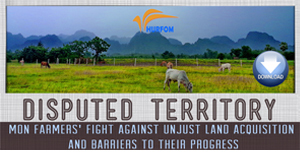 Acknowledge ethnic concerns regarding land and land policy and initiate reforms to pro­vide more HLP security for small-scale farmers and villagers from eastern Burma’s ethnic regions as well as to secure the durable return of IDPs and refugees. 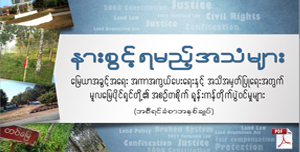 Immediately halt all land confiscations and return the land to the people or adequately compensate them for the confiscated land. Develop a comprehensive, clear and shared position on HLP rights in consultation with the local communities, CBOs, IDPs and refugees. Ensure that mega development projects are implemented with the full, prior and informed consent of the potentially affected communities including holding meaningful consulta­tions, being transparent, and making the information accessible in local languages for the potentially affected communities prior to the initiation of the projects.